It’s a good harvest this year and a good practice of living with the unknowable. We’ve never had much luck with squashes. The growing season is short and that means there’s only a sliver of a window in which to get the squash seeds in. A cold and prolonged Spring or an intense hot Summer can wipe out any dreams of crook-neck stir-fried with greens served al fresco or a warming curried Buttercup squash soup on a chilly Fall day. But the predictive equation of life is riddled with hidden variables so despite a head start in the Spring with the Buttercup (middle green one) planted in carefully protected boxes, we got two. Planting even later, I threw down two types of seeds outside the wire, the area that was to be tilled for strawberries, and promptly forgot what they were. Nothing germinated and I forgot also that I had planted anything. They were spaghetti and crook-neck in the foreground of the picture. This is what I love most about the teachings of gardens. They give only what they can. Maybe we can call Nature cruel, indifferent or insensitive but I doubt the rain, soil and artificial walls consider their role as having such valence. I think it is more an issue of the depth of my own vision. Each planting is invested in a future projected from my own eyes. And I cannot see that I am blind. We could call it ignorance but it isn’t a willful disregard of reality. It is closer to a blurring of the uncomfortable truth that I have no more control over what will come of my investment in the seed than the seed has of itself. Sometimes, like true teachers, gardens give what we’ve asked for though it may not be in our time line. We had spread the compost from last year across the space for strawberries and from the depths, a squash seed sprouted. 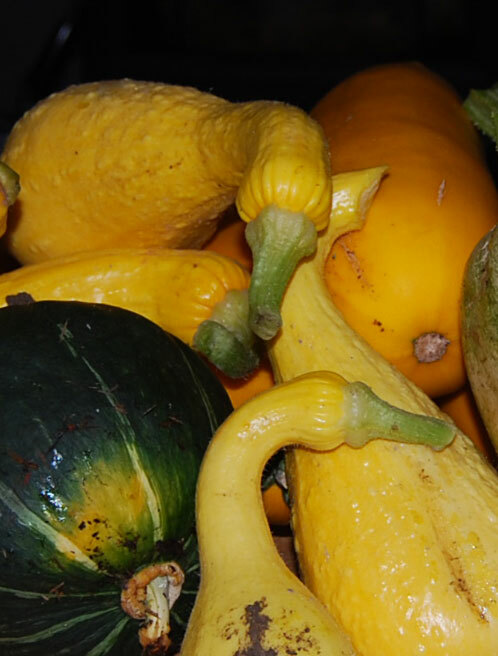 I joked with Frank that the volunteer squash were mules because none of the flowers set to fruit (not surprising because store-bought vegetables usually don’t re-produce). He informed me on the weekend that if the orange bulb growing is any indication, it’s likely a pumpkin, something we’ve coveted for years as a jewel in a Fall garden. So I practice refining my vision, adjusting the focal length to capture at what is truly at hand. There in the stack of golden harvest is a lovely interplay of a hidden relationship. Can you see it? This entry was posted in 108 thoughts, reflections and tagged gardens, ignorance. Bookmark the permalink. Gardens are, indeed, true teachers. And even better than those other “true teachers!” At least we can eat up a garden. Those other teachers are harder to digest. Ah the words of a true… oh… er… a True Master Gardener!